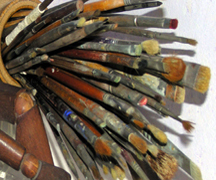 Wyllie's brushes, paints, pinboard and etching burin. 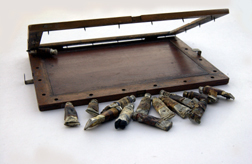 He worked with a flat board known as a 'pinboard' on which the paper was held tight by a set of protruding pins attached to the frame. He would first take the paper to a basin and soak the back of it, then lay it on the pin board. A frame with the pins protruding would fit over the top. While the pin board was still open, W.L. would lay on the wash for the sea and sky, always much darker than would appear normal. With a large soft brush, the hairs of which had been sucked into a hard, broad point, he would then pick out the lights. He never used body colour. 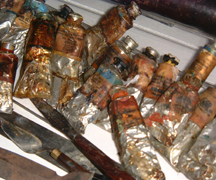 Wyllie's oil painting technique was direct and he never painted paint over paint. If he hadn't finished the work and had to continue on a part finished area the following day, he would scrape the old paint off, right back to the canvas, and start again. His favourite canvas size was 32" x 18" as he thought that size appealed most to the dealers. Those pictures were known in the family as 'pot boilers'. When the light faded Wyllie stopped painting because he did not want to paint in artificial light. The Panorama of the Battle of Trafalgar, National Museum of the Royal Navy, Portsmouth. Wyllie's 42' x 12' Panorama of the Battle of Trafalgar. 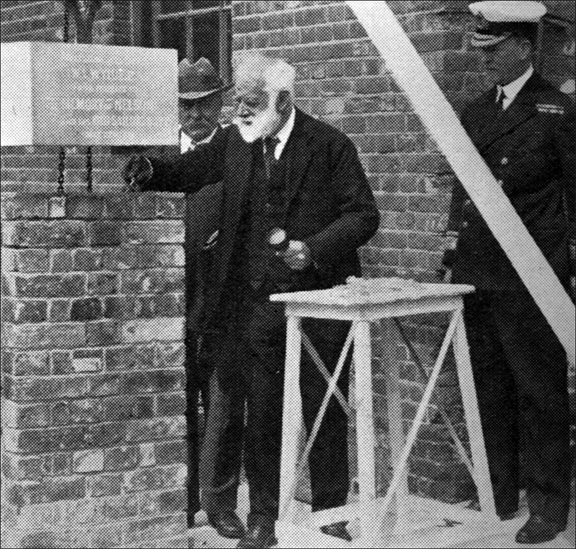 Wyllie laying the apse foundation stone. Wyllie and his daughter Aileen painting the Panorama. 'This, the dream of my life, has come to pass'. 'In my opinion, it is highly desirable to take immediate advantage of Mr. Wyllie's generous offer. Mr. Wyllie is an elderly man and despite his unimpaired skill and remarkable vigour of mind and body, there can remain only a rapidly diminishing period of time during which he could undertake a work of such magnitude'. On 17th July 1928, King George V was due to visit the Dockyard to view the restored Victory. In an inspired piece of direction, Admiral Donaldson, a personal friend of Wyllie, suggested that he should construct a model of the panorama and place it in the Pescot Frost Museum, which the King always visited. Wyllie made a beautiful water-colour sketch of the envisaged scene and mounted and stretched it on a semi-circle of plywood.. This model was made to be viewed through a scale model of the stern of the French warship, Neptune. As planned, the King saw the model and was most enthusiastic to see the completion of the proposed panorama, and offered to come and open the finished work. The loan was forth coming and by 1929 the walls of the new apse were four feet from ground level and Wyllie was asked to lay a commemorative stone. Wyllie’s 'Panorama of the Battle of Trafalgar' is one of the last important works of this kind still intact. Painted in 1929 by the seventy-nine year old artist, assisted by his daughter Aileen, it has long been regarded as his masterpiece. But, by the late 1990’s it was beginning to show signs of age. Museum staff decided that the major refurbishment of the Victory Gallery offered an ideal opportunity to remove the Panorama for extensive, expert conservation, but the painting was so large that it posed complex problems for the conservators. 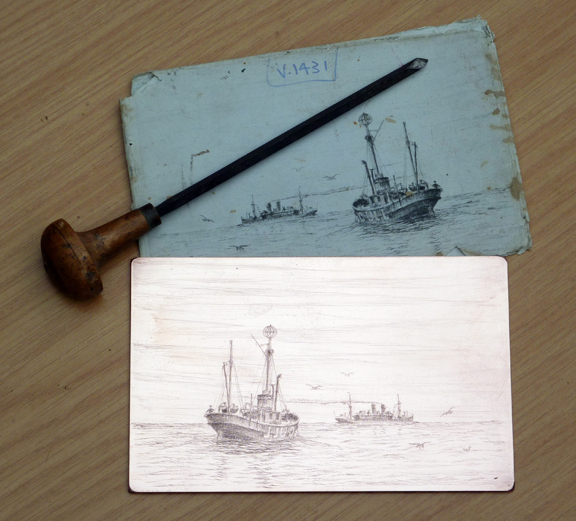 Financial backing from the Society for Nautical Research enabled the Museum to enlist the services of accomplished restorers. The DVD ''HMS Victory and the Panorama of the Battle of Trafalgar' graphically illustrates the saving of H.M.S. Victory & the history & restoration of the Panorama.